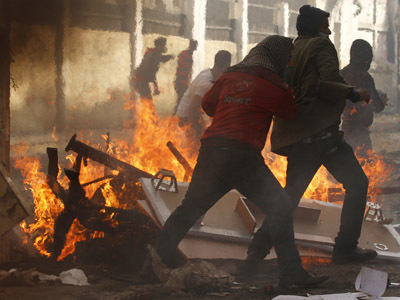 Egypt’s President Morsi has rejected opposition calls to form a national unity government and start a dialogue to end the violence that has claimed dozens of lives. 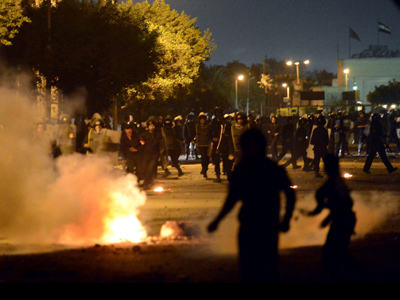 Two more protesters were killed in clashes near Tahrir Square on Wednesday. ­“In Egypt there is a stable government working day and night in the interests of all Egyptians,” Mohhamed Morsi said in a press conference in Berlin. He added that he is not planning to form new government before the upcoming parliamentary elections. The National Salvation Front’s ElBaradei, a Nobel Peace Prize winner, said earlier on Wednesday that stopping the violence was a priority for everyone in Egypt. ­“We need an immediate meeting between the president, defense and interior ministers, the ruling party, the Salafis and the National Salvation Front to take urgent steps to halt the violence and start a serious dialogue,” ElBaradei tweeted. He also reiterated the demands of the opposition, including the formation of a national unity government and a commission to amend the Islamist-backed constitution. ElBaradei’s has found unlikely support in the form of the Salafi Al-Nour Party, the ultra-conservative Islamist party that’s put forward its own initiative for resolving the Egyptian crisis. This has raised suspicions of division among Morsi’s Islamist allies. Egypt must not be ruled “by a single faction… but there must be a real partnership in decision-making and administration,” Al-Nour’s Makhyoun told media after his meeting with the NSF. Al-Nour has spoken in favour of a new “national salvation government,” and says it agrees with the NSF on forming a constitutional amendments committee and appointing a new prosecutor general. Morsi’s Freedom and Justice Party (FJP) responded to ElBaradei’s call by saying such initiatives “are worthy of attention” if the intentions are “good” in a statement posted Facebook. “The party will consult political forces under a national dialogue to reach the best solution supported by the majority,” the FJP statement said. The party’s Executive Committee will study all such initiatives, it added. 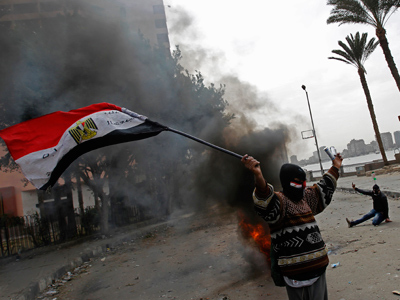 The statement made no mention of the conditions laid down by the opposition, which so far have been ignored by Morsi. President Morsi has been holding his own national dialogue program, which has been boycotted by the opposition. Morsi’s dialogue “is to do with form and not content,” ElBaradei said. 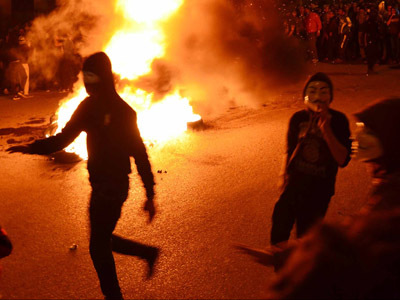 Meanwhile, two more protesters were reportedly killed in the ongoing unrest in Cairo, bringing the total number of dead across the country to sixty. 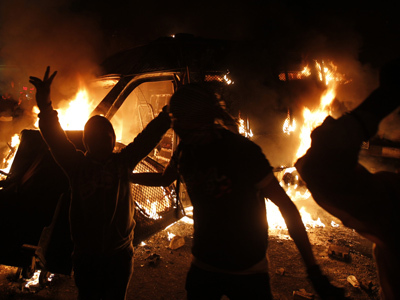 The victims were shot near Cairo’s Tahrir Square, an anonymous source told AP. On Wednesday Morsi was in Germany. Under pressure both domestically and internationally, President Morsi is desperately trying to secure funds and get international support in his short EU tour, blogger and journalist Wael Eskandar told RT. Eskandar believes that the “hesitant” president “is trying to secure his international relationships so that he can oppress the people back in his country.” He added that the protesters and the opposition view Morsi as a “lying president” and a “puppet” of Muslim Brotherhood’s Guidance Bureau. 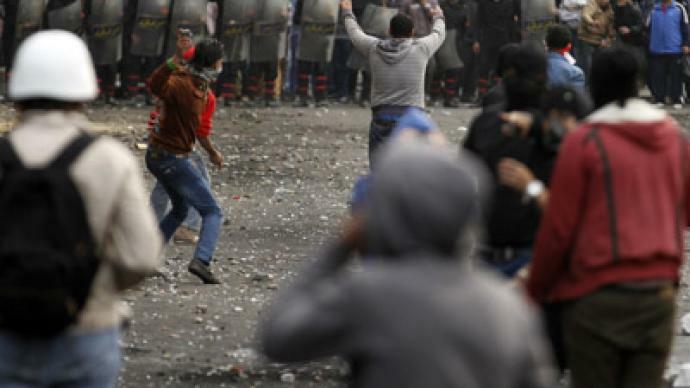 But the pressure and the escalating violence is forcing both Morsi and the opposition to “find a way to real serious dialogue that people can commit to,” Eskandar said. If Morsi responds to the opposition’s demands for a national unity government and starts taking steps towards democratic reform in Egypt, “there might be a solution out of it,” Eskandar told RT.